no point have I ever been able successfully to keep a diary; my approach to daily life ranges from the grossly negligent to the merely absent, and on those few occasions when I have tried dutifully to record a day’s events, boredom has so overcome me that the results are mysterious at best. What is this business about “shopping, typing piece, dinner with E, depressed”? Shopping for what? Typing what piece? Who is E? Was this “E” depressed, or was I depressed? I would split the hair again and claim that there’s a difference between a diary and a journal – that it’s sort of like the difference between an autobiography and a memoir: in a diary you record each day’s events and in a journal you write whatever you want about your day whenever you want to write about it. For Didion, though, it’s all about the notebook. I keep three versions of a writing notebook: a journal, a writing notebook, and a writing planner. In my journal I write down what happens to me, what I’m thinking about, occasional random observations, lists – the usual stuff you’d write in a journal. But I include this under “writing notebooks” because (especially as a writer of creative nonfiction) I often look back on journals to remember a certain time or place or person or line of thought – although I never write in my journal with this in mind. I write here solely as a person – not a writer. In my “official” writing notebook I jot down ideas for writing projects, make lists for writing projects, and write sketches of writing projects. Often I’ll start writing towards a draft but without any sense of where I’m headed. Writing by hand takes the pressure off: I can’t send ripped-out notebook pages to The New Yorker. But when a piece moves from my notebook to my computer and eventually (sometimes) to publication, I can see that long passages are often exactly the same as when I wrote them by hand the first time. Then there’s my writing planner, the newest addition to my series of writing notebooks. It’s a Moleskine “weekly notebook” that has a calendar page laying out the days of the week on the left side and plain lined pages on the right side. I use this for short- and long-term planning. When I hear of a submission, contest, or application deadline I write it down on the calendar side; then I flip back a few weeks (or months) and write a reminder on the notebook side. On Sundays, a day I usually have a long swath of time to myself, I flip to the next week and write some plans. Then, during the week, when I have an hour or two to myself, I open my writing planner and do what it tells me (this is especially useful when the demands of everyday life are so crushing I can’t think straight). 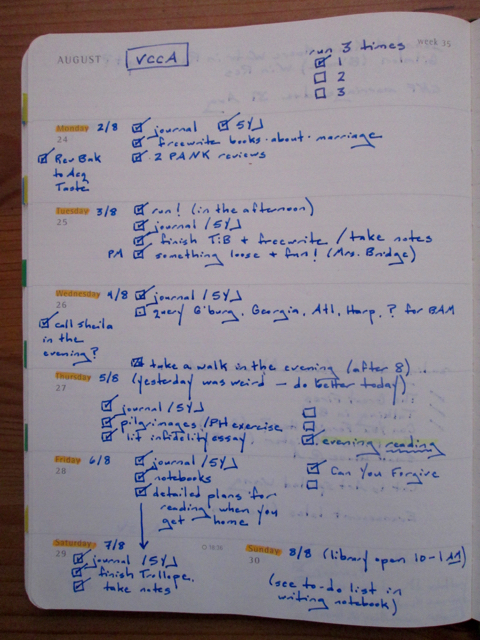 If I find that I can’t manage much I flip ahead a week or two and write “don’t forget about [idea]” and try again then. Every so often I flip back to look for unchecked boxes. It’s a lovely tool for preservation – and for looking and planning ahead to, say, a retreat or residency. What would Joan Didion think of all these notebooks? I smile/shudder to think. But my writing notebooks keep me writing – through rejection, triumph, inspiration, and disenchantment; in the face of preschooler twins, tantrums, field trips, and snow days; on the crests and in the troughs; at home and away – all the months of the year. Randon Billings Noble is an essayist. 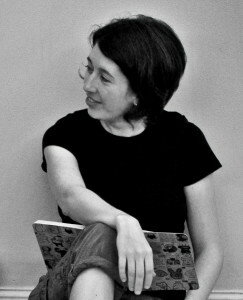 Her work has appeared in the Modern Love column of The New York Times, The Georgia Review, The Rumpus, Shenandoah, Brevity, Fourth Genre and elsewhere. She is a nonfiction editor at r.kv.r.y quarterly, Reviews Editor at Tinderbox Poetry Journal, and a reviewer for The A.V. Club. You can read more of her work at www.randonbillingsnoble.com. May I teach with this? Yes! Thank you! I loved this. I also have several kinds of handwritten notebooks, digital journals, digital planners, handwritten planners, sticky notes. It may seem random, but it all makes sense to me. You’ve given me several ideas on organazation I was struggling with. I have a notebook of phrases or sentences gathered from excellent books I’ve read. Many become prompts for future writing. This made me think of another way I have come across old notes: written letters. My mother saved old letters I wrote her while I was away and in reading them I was able to capture of piece of my own forgotten history. Now I write letters on my PC and have arranged them by date. Even in reading letters from others we can find old gems lost to the memory. I loved this article. May I ask what brand of notebooks your journal and official notebook are? Also I thought the unchecked boxes under “run 3 times” were hilarious… I’ve been there far too many times. I use a Blueline composition notebook for my journal. My writing notebooks vary — I’ve used Greenroom composition books and Miquelrius spiral-bounds and I’m about to start a new Moleskine one. Hope you keep up your momentum — with both writing and running! Journaling is something I really want to start doing. I’m just not sure in what form I want to do it. Do I want to do it in a notebook or do I want to do it on the computer in the form of a blog? I’m not sure. Thanks you for writing about your journals. I tried a few times to keep a journal, to use a planner and now I’m doing a course ‘freewriting’ (write every day 15 minutes pen/notebook). Everyday writing is hard… I often forget. I have to find my way in this. I love this. I have always kept some sort of a journal; although, I am not always organized about it. I write for clarity of my own mind, and sometimes I write just because I have something to say to no one in particular. I’m taking a course right now that requires us to start a blog, so I think I will use some of your tips for keeping ideas to write about. Love this.I need all three in my life! I loved writing journals but I find typing them on my computer is not fun at all so I end up not doing it. At the same time I don’t want to accumulate a bunch of books throughout my life. Then again, why now? What a great article, thank you. It drew me in, as keeping notepads is one of the most personal, writerish things I do, and for me, has an almost superstitious, rabbit’s leg quality to it (can you believe there was a time we put rabbits’ legs on key chains?). I’ve been using a pocket notepad, like Mead, for about 20 years now, and fill a shoebox full of them as a weird thing to look upon and think wow, look at all that, there…and now, as a blogger and first-time, would-be novelist, that daily practice, or comfort that comes from writing long-hand is starting to translate to content I can convey to my computer. So I may not be doing a good job of it here, but all this to say I think the act of writing long-hand helps us cement ideas in an important way, so that when we do really commit to the words in another format, it’s like another draft, like we already know it or have the confidence to think we do, which is pretty much everything. And OK alright, I guess it’s good for planning too. I’m definitely stealing your concept of a writing planner! Great idea for keeping track of deadlines and writing goals–thanks! I used to be able to attend a weekly writing group where everyone wrote in their notebooks/journals for 45 minutes and then read what they wrote in small groups. No one was allowed to comment. As you said, I think it’s so vital that we writers have places where we can write as people, not writers, and feel free of criticism. There’s a time and place for feedback. The journal is not it. Happy writing! I love to write! Journaling is incredibly therapeutic in my opinion. Thanks for sharing! Wow let me just say something, you have beautiful handwriting!! I can only dream of having any of my writing ever look that amazing. These days it’s looking more and more like nondescript scribbles on a page. Maybe I should start a journal of my own. Very cool article with great insight into the different types of thought processes used. I still love the process of writing longhand for creative work. Something about the flow from head to hand I suppose. Thanks so much for sharing. I love the look and feel of moleskin notebooks. I have always purchased the small ones with lines which I usually use when travelling. I think the writing planner ideas are perfect. Guess I’ll be shopping for one of those. Great insight especially to new writers like me..ideas always pop up anytime, paper + pen are always great companions.. Yes, it actually helps.Even i use many different books to write my stuffs. Its good to keep notes, especially when your doing a piece later on and have them at hand, there’s no substitute for or own personnal experiences. I always carry a note book with me, no matter where i go! Thanks! I use just 1 diary in which I write everyrhing-stiries from my depressed days to planning what to do next and draw at the same time. And it’s really a messed up thing sometimes when I try to find a thing I wrote. This article seems useful. Now even I’ll make separate diaries to keep it all organized. I journal for mental health as a form of expressing the ideas that consistently flow throughout the day in my thoughts and act more like distractions that keep me from focusing on the work in front of me. Journaling is therapeutic, a release of pent up emotions, frustrations and most of all, desires. Great insight into the physical aspects of writing and into your own practices. I really enjoyed reading it. Do you also write your creative work – poetry, essays, etc. – in journals or mostly on a computer (or maybe even a typewriter!)? I always find myself collecting notebooks in hopes of filling them in. I need to get to it. I’m wasting precious time! Ahhh. I journal regularly, but am more a note-jotter when it comes to ideas. I love the writing planning notebook – will try that. This is great. I have a calendar/agenda book which provides plenty of space for daily musings. That’s what I use. A notebook is such a great thing to have on the go, at home, everywhere. Thanks for the post! Thank you for sharing your journals. I was curious about the information that is in journals. Now I’m ready to journal instead of pasting tidbits of information to memory. I’d rather have a cluttered desk, than a cluttered mind. Thank you for your inspiring post! You made me thinking back about how I organize my journal and writing drafts. I never really organize it to be honest yet I know that would be necessary for helping me to write. I do enjoy writing using both pen or computer on a blog, but I never get satisfied about what I’ve been writing. Maybe I should start over with my writing’s plan and stuff. Thank you! yah its really amazing technique. and intresting. thanks for shearing. I always keep a notebook handy. I get through them like nobody’s business! It’s the way I convert all the confusion in my head to legible story plans. The problem is, it’s far from organised. I’m going to put your advice into practice and (hopefully) untangle this muddled brain of mine! Yeh, this is cool. I, likewise, keep diaries (for the last 21 yrs) and journals (for the past 6 years). 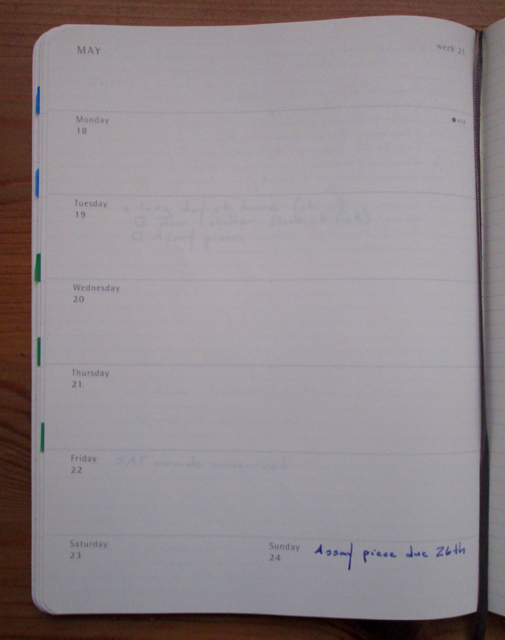 Diaries are specific: dates of trips, events, Children’s exams and occasionally, what I did on a certain day. It is also very much work related, so things like meetings and who am I meeting and where. Journals, however, can be about the day or, about a day in my past. It can be about an incident or if I’m following an online course (such The Artist’s way)then everything will be poured into the journal. I also write about what I feel. Right now, I’m following Jeff Goins. He says as an exercise, write about something controversial, something whereby you are not concerned about what people think. So, all that will be in the journal. About once a year I will dip into the journals just to get an idea of what I was thinking/doing at that time. Great article! I just recently purchased my first pocket journal. I divided it into several sections, including: Weekly events, Quotes, Thoughts/ideas, People I meet/ contact info. I have a vision to create a very interesting life for myself, and I want to have tangible evidence of the journey, so I can reflect in the future. Does anyone have any other section ideas? This entry was very helpful. Thank you for sharing. This is fascinating to me! I’ve tried to be that organized with my multiple notebooks, but I keep falling back into the habit of using one notebook for everything. Lines ended up limiting me and I eventually began using sketchbooks (plain notebooks) for all my writing and daily notes. A lot of writing space and freedom that way, even if I can’t write in a straight line. Things get lost, though. I may try to reorganize again and stick to it. Thanks for the article! It is funny how writers have so many places to put and organize their thoughts. I appreciate you sharing yours. I certainly wished I was as organized and talented as you–maybe I need to organize better. Lately, I find myself staring at the Moleskin notebooks at the bookstore–then chiding myself for wanting to spend so much more money than is necessary, and then drifting past them again before I leave the bookstore. I wonder what that is all about. Thank you so much for sharing your thoughts and ideas! I, too, like yourself (and many of the other commenters) keep a journal. Truthfully, I have four! I tend to put them down and forget where I put them. So, when I have something on my mind that needs to be written down RIGHT NOW, and I can’t find any of the journals I’ve already started…I start a new one. It’s a wonder I don’t have 20 or more. I really enjoy your blog. Can’t wait to read more. i also have the habit of writing down whatever i’m thinking. I usually have some paper or small notebooks in my bags wherever i go, or i use memo notes on my phone. Later on, some become my blog posts, others are just my thoughts for the night. I used to try to keep notes on my phone or an ipad – little voice messages to myself but the problem with that is the phone can run out of charge, or break and you have to back it up regularly or else you lose everything. Although I’ve always carried diaries and notebooks of one form or another around with me I used to struggle with the self – discipline of committing to paper everything interesting or creative that popped into my head and as a result a lot of good ideas were forgotten or never acted on. A tip I learnt from a good book I read recently recommended making your notebook the most expensive one you could afford. It’s worked for me. I bought a fabulous Moleskine notebook which was a ridiculous price considering that I could have picked up a notebook from the local supermarket for less than £1. But it’s so well designed that it’s a joy to use and the hefty price tag means I want to get my money’s worth out of it so I’m motivated to use it. Another little tip from the book (called The Organized Mind btw) is to write ideas down on those index cards that you can buy. I’ve written a review of The Organized Mind here http://themagichappinessof.com/2016/02/18/self-help-the-organized-mind-by-daniel-levitin/ if anyone’s interested. @rob. I’m in the same boat and find myself doing both. Love this! I carry Field Notes with me all the time. I keep a journal at home, and much like you, I’m the only one to whom these make sense. I’m all for the pen-and-paper journal/diary/notebook. Great essay with practical advice for writers. It makes me want to buy a new notebook and pen! Fun piece and make all who read it consider how and where they record, plan, and revise. Would make for a cool AWP panel, I think! 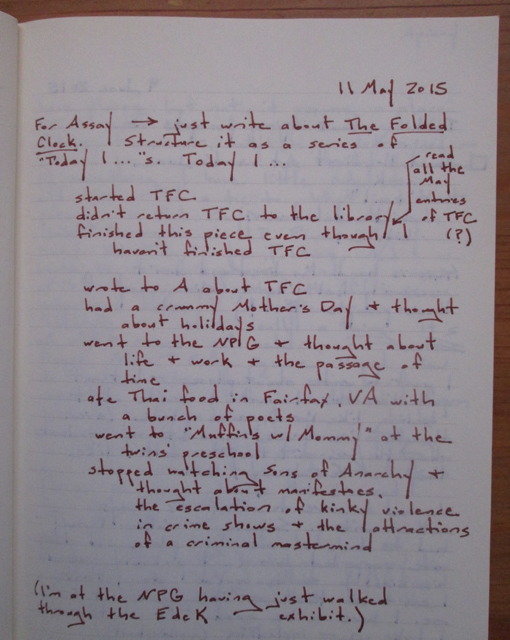 I was delighted to read this piece and to discover that I use exactly the same moleskin diary for my own writing planner (thank you for the photos!) And yes, I have two other formats for long form journalling and notetaking. For journalling I use a fountain pen which both slows me to the pace of things and moves with a pleasurable ease across the page. We used this in class yesterday, and my students LOVED it. Thank you for such generous and thoughtful writing about writing.